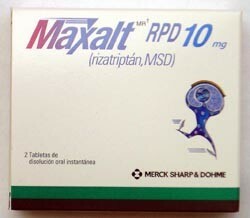 • Maxalt is usually taken three times a day (every 8 hours). • Take a single dose of Maxalt as soon as migraine symptoms appear. A second dose may be taken if there is only a partial response or symptoms of the migraine return. However, do not take it sooner than 2 hours following the first dose. Do not take more than 30 milligrams (mg) in a 24-hour period.